What makes an article or a blog post more readable? In some cases, it’s the white space, the photos and the graphics that accompany it. But how do you find the right graphics to go with your article? While I’ve mentioned sites like iStockphoto and Dreamstime before, and Flickr is always great when you find an image with creative commons licensing, I recently found another site that makes adding photographs a snap. Wylio has millions of photographs in its database, all of them with rights to use the image in your blog post. And what makes it easy is it does all the work for you. Simply search for your keyword, and images will pop up onto the screen. View the images until you find the one you want. 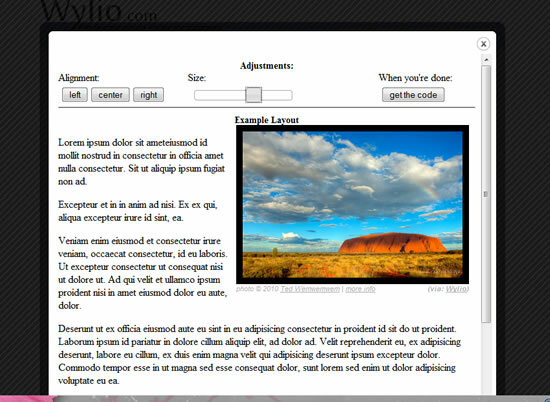 Wylio will open a window that shows you the placement of your image within the text and the sizing. Adjust until you have it the way you want it. Then copy the code and past it into your blog post. It’s that easy. Wylio builds the frame, and includes the credit back to the photographer, plus a link to their image for copyright information. It’s all included in the code, so you don’t have to think twice about it. Just pick the image and go.